• Traffic is slow in Hetton due to an accident on North Road in both directions from B1260 Durham Road to Hazard Lane. • A car and a motorcycle have collided on the A194 Leam Lane westbound at A19 Lindisfarne roundabout in Jarrow. All lanes have now been reopened. • All lanes have been reopened after a HGV broke down on the A19 southbound at Easingtonbetween the A182 (Murton Interchange) to the A1086 (Little Thorpe junction). • A road closure is in place in South Shields. The A183 Pier Parade will be closed daily between the junction of Lawe Road and the Sea Hotel for resurfacing works. The road will be closed today and tomorrow between 8am and 6pm. • There are delays of up to 15 minutes to trains running between Fellgate and South Hylton due to a technical fault with the level crossing at East Boldon. • Disruption cleared: One peak service operating between Monkseaton and Pelaw in both directions will not be operating this morning due to a train fault. Trains will call every 6-12 minutes between Monkseaton and Longbenton. • Disruption cleared:One peak service between Regent Centre and Pelaw will not be operating in both directions this morning due to a train fault. 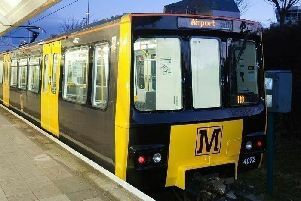 Tyne and Wear Metro has apologised for any inconvenience caused.